Our methods of proven scoliosis treatment can stabilize your spine better. Learn the benefits of advanced therapy devices backed by research-based clinical methods. Scoliosis treatment differs from center to center. Some offer care based on specific methods developed by others, while most scoliosis treatment is similar to the treatment of mechanical spine conditions. Scoliosis treatment at the Chiropractic Specialty Center® is based on well-researched methods developed by others that are further enhanced with systems, methods, and technologies that are incorporated into NSD therapy® methods of care. In other words, our scoliosis treatments are a combination of several methods enhanced by our specific spine and joint pain rehabilitation methods. Therefore, you get the benefits of other methods as well as those offered through NSD Therapy® and our targeted methods of chiropractic, physiotherapy, and rehabilitative exercises specific to scoliosis. Scoliosis is a complex neuro-musculoskeletal disorder that requires targeted, specific treatments. Typical findings in scoliotic patients are spinal joint pain and malfunction, muscular rigidity, ligamentous laxity, and even spinal degenerative disc disease. A targeted treatment plan focuses on each of these structures in addition to specialized therapeutic exercises. Scoliosis is case-specific, meaning there are individual variances that require specialized attention. As such, the cut-and-paste methods used by other providers may be of some use for certain types, but the more complicated cases need accurate assessments followed by specialized scoliosis treatments. 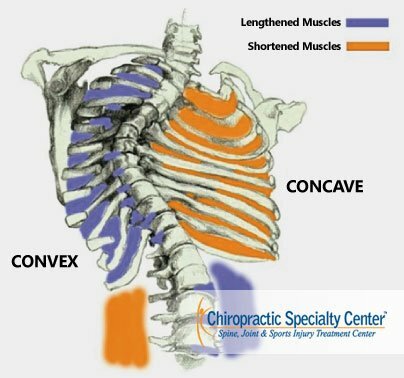 To understand the need for the collective, collaborative care we offer, it might be helpful to enhance your understating of the spinal column. The spine is an important part of your body. It houses almost all the nerves your body needs to function. Additionally, it provides support and structure to your body. The spine starts at the base of your skull and runs all the way down to your pelvis; it is made up of 33 individual bones called vertebrae. Each bone (vertebra) is about an inch thick and stacked upon one another to form the spinal column. Only in the thoracic region (upper back and mid back area) are the vertebrae connected to your ribs, flat but curved bones that provide structural protection to the vital organs such as the heart and lungs. Each vertebra consists of a body, lamina, spinous process, transverse process, and articular facets. To make it simpler to understand the anatomy of your spine, the small protrusions that you feel at the back of your spine from the skull to your tailbone are what we call the spinous processes. These are the out-pokings (spinous processes) located at the back of the vertebrae, while the body is located at the front of the spine, and the transverse processes are the pairs of protrusions on both sides of the vertebrae, to which the back muscles attach. A concave structure is one where the surface has turned inwards, and “convex” describes a curve that has turned outwards. Concave and convex, when used in reference to scoliosis, describe how the scoliotic curve has shifted in relation to the midline of your body. It may be better to visualize the terms concave and convex terms as referring to either the top of the rainbow or the bottom of the rainbow. The top of the rainbow bows outward, while the bottom bows inward. So, the convex part of the curve is similar to the curve at the top of a rainbow, and the lower portion (bottom) of the rainbow, where the curve turns inward, would be analogous to the concave aspects of a scoliotic curve. Scoliosis is a complicated, three-dimensional disorder of the spine. In scoliosis, the affected individual may have both lateral curvature and vertebral rotation. Lateral curve scoliosis is present when the vertebral column bends from side to side. The curvature can be a single (C-shaped) curvature or a double curvature making it an S-shaped curve. Unlike others, the chiropractor and physiotherapists of the Chiropractic Specialty Centers® pay added attention to the type curve you have. The “C-Shape” and “S-Shape” characteristics of scoliosis are markers that render scoliosis either easy or difficult to manage. The “C” Shaped curves are typically easily treated. But, the “S” shaped curves required expert-level care offered by our clinical teams. Rotational scoliosis, on the other hand, is more complicated as it causes a twisting deformity of the vertebral structure. As the disease progressively worsens, the spinous processes in the area of curvature will rotate toward the concavity of the curve, while the vertebral body rotates to the opposite side. For example, a patient has a left concavity of thoracic curvature; the spinous process tends to rotate to the left while the vertebral body rotates to the right. Therefore, the involved vertebral bones in the affected scoliosis region turn in a three-dimensional manner. On the concave side of the curvature, the ribs are close together whereas, on the convex side, they are widely separated. As the vertebral bodies turn, the spinous processes rotate and deviate more and more to the concave side of the scoliotic curve, pushing and turning the ribs along with them. The back surface of a scoliosis spine can be more elevated on one side, producing a rib hump. This is caused by the posterior ribs being pushed to the back on the convex side, causing rib protrusion on the affected side. On the other hand, the anterior ribs on the concave side are pushed anteriorly. On the concavity side, the vertebrae and intervertebral discs (spinal disc) are decreased in height. How Important is the Three Dimensional Component? The degree of importance given to the three-dimensional aspects of scoliosis can never be overstated. Therefore, the care you get from a Chiropractic Specialty Center® focuses on stabilizing scoliosis from a three-dimensional aspect. Even though the mechanisms regarding the various rotational components of scoliosis are poorly understood, it has been implicated as one of the leading factors in scoliosis cause and progression. Therefore, it would only make sense that it should also be considered in scoliosis treatment, and that is exactly what our centers have done. The care you get from Chiropractic Specialty Center® is second to none. When it comes to treatment of the spinal injury, joint pain, sports injuries, and scoliosis, our methods, systems, and technology are second to none. Visit our scoliosis teams of chiropractors and physiotherapists today and receive the best non-surgical scoliosis treatment in Malaysia.